A lot has happened since my last post, both in my life and in Digimon. I can't really hide my disappointment at Adventure tri being a theatrical series; on one hand films allow for condensed effort and really high quality animation, but on the other I love the magic and anticipation in a fifty-episode weekly series. (Except when it's a trainwreck that drags its feet in both directions like Cardfight!! Vanguard G. My main fandom is a mess.) The very recent announcement of Digimon World Next Order has given me another reason for owning a Japanese PSTV, although I gotta admit I'd love to see Next Order get an English launch on the 3DS with Miiverse screenshots enabled. The revised Miiverse is gonna be a blast, and 3DS is my preferred system for just about everything. 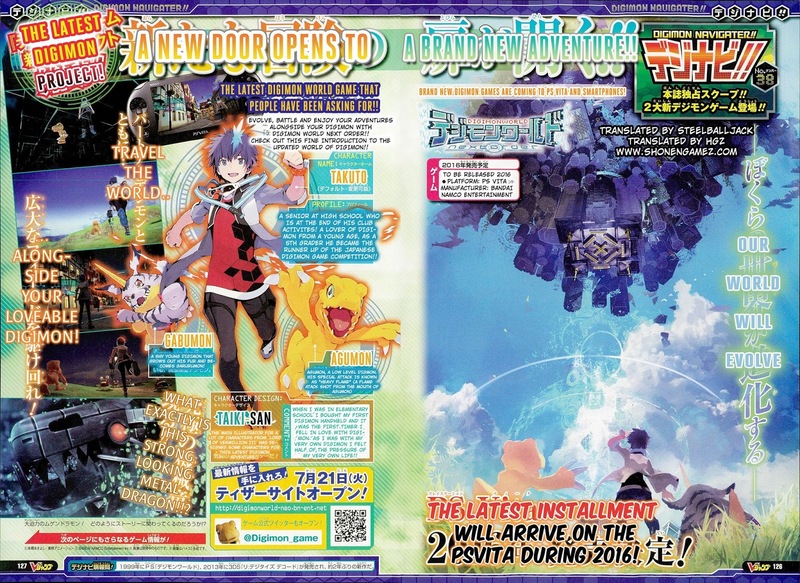 And it's a Digimon World 1 sequel! I really couldn't be happier with getting a modern game with those mechanics. If we got Next Order I wouldn't particularly mind passing on Decode. I'd prefer a game unmolested by Yasuda. I am absolutely thrilled that the game will not be dubbed, and a little surprised at the negative reaction this has garnered. There are some great English-language voice actors are out there, and Bandai's never in a million years gonna buy them. But this is also my bias talking; I habitually avoid dubbed material in any language. (Can anyone stomach the English renditions of An Die Freude? Alle Menschen werden Brüder, Wo dein sanfter Flügel weilt is way more invigorating than Father love is reigning o'er us, Brother love binds man to man or anything else that gets cooked up in translation.) I'd encourage everyone to keep an open mind about foreign languages and try hearing a performance in a language they don't understand--each language in the world is a unique form of self-expression that permits dialogue in a way no other does. In this case, you get to hear the sound and the vocal affect of the original language the text was written in, while also having the meaning transcribed for you in your own tongue. That's a very unique opportunity. My lone reservation on Cyber Sleuth is that I feel the game is due for the Decode treatment. Look at all the holes in the roster. You have Cherubimon Virtue but no Vice, Turuiemon absent so Galgomon gets shoehorned in as Cherubimon's Adult, Fladramon but no Lighdramon, and as a whole there's almost no Armor evolutions in the game. Every Royal Knight and Demon Lord has been crammed in while somehow nothing else past the third season of the anime made the cut into Cyber Sleuth. There's a lot of room for improvement in the roster, and in the pool of available equipment. That said, I know I'm committed to buying the game. I threw money at All-Star Rumble, and after importing Cyber Sleuth I'm in so deep that it's hard to imagine not buying and playing it in my native language. My level of Japanese comprehension isn't at all on the same plane as my English comprehension, and I'd like to play the game without having a dictionary in front of me. Cyber Sleuth has been a learning experience. Both in running an LP, and in reading Japanese--I've expanded my vocabulary a lot more since beginning, and become familiar with grammar that wasn't at all covered in my formal education. And I'd like to continue with that experience, even though it means a lot of summarizing and glossing over conversations. Well, most of my disappointment about the lack of English VAing is that it would have lended an excellent dub, but you are right in that Bandai likely wouldn't have hired the good talents. I actually prefer playing games in their original audio, but I'm worried mainly because English VAing tends to garner a larger audience as a whole, so I don't want it to end up being a turnoff...a dual audio thing could have been really nice. But, again, this is already kind of a localization risk to begin with for Bandai Namco and I'm thrilled the game's getting localized at all.